Absolutely free and easy to use STEP file viewer! STP files are saved in text-based ASCII format containing STEP ISO Application Protocols. It contains 3D (three-dimensional) object data saved in Standard for the Exchange of Product Data (STEP) format. STP file format primary use is transferring 3D graphics between different CAD and CAM systems. Because of their ASCII structure, STP files are easy to read, with one instance per line. STEP file format is defined by ISO 10303-21 Clear Text Encoding of the Exchange Structure. There are three editions of ISO 10303-21. First edition was released in 1994 and last was released in 2016. In last edition added is anchor, reference and signature sections to support external references, support for compressed exchange structures in an archive, digital signatures and UTF-8 character encoding. ISO 10303-21 structure it contains two sections, header and data section. Header section has fixed structure consisting 3 to 6 groups in given order. The DATA section contains application data according to one specific express schema encoded following some simple principles. STP Viewer is a professional tool for viewing CAD models with excellent speed and quality. 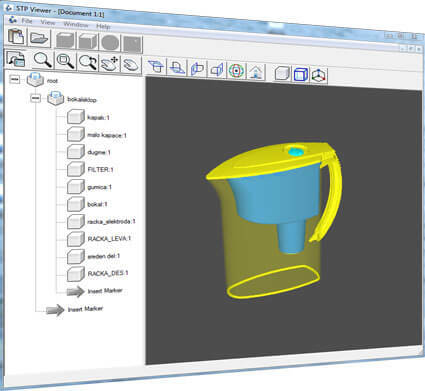 STP Viewer boast a very user-friendly interface for non-technical users while providing full range of tools for navigation and analyzing the 3D object. For advanced users of this kind viewers there are most of the known command as on any STP Viewer, and for beginners and non-technical users there is a help, and explanation on every tool how to use and what that tool do while using STP Viewer. Very interesting feature in STP Viewer is tree view where you can see all markers that are used in 3D object. You can easily hide or unhide them and see all object part by part. With STP Viewer except zooming and panning you can see the object in 2D in any of the 4 sides (top, bottom, left, right), you can add shade to the object to see how will look like as an real object or to see only wireframe. STP Viewer also allow changing color of wireframes or shade of 3D object. STP Viewer is a software tool for viewing international STEP standard files. STEP files (.stp) for 3D and assembly are often used by all major mechanical CAD systems. With our absolutely free STP Viewer you can easily open 3D files (*.stp), rotate them and perform some basic actions like: zoom, rotate, move or change skin. Download STP viewer and start viewing the world in 3D. Please refer to the Walk Thru section for more information. Why do you need STP Viewer? When you open 3D object (STP files) you need speed and good interface to view every detail in that 3D object. With STP viewer by hide/unhide markers in tree view you are able to see every part separately. With ability to add shade-skin, you can see every part how should/will look like in real. Rotateing the object allowing you to see every detail in every side of the 3D object. With wireframe and rotateing in the same time you can see all elements that created 3D object as one whole. All these elements that we mentioned in the text above are implemented in our STP viewer, and the best of all is that STP viewer is a FREE tool. Supported Operating Systems: Windows Server 2003; Windows Server 2008; Windows XP; Windows Vista; Windows 7. Microsoft .NET Framework 2.0 (included in Windows XP SP2, Vista, Windows 7). 3D object are avaliable in many types of file extensions. As the most popular extension for 3D objects except .stp are .stl and .igs file extension. For opening this types of file extensions there are many viewers as STL File Viewer and IGS File Viewer, that are totally FREE for use and provide many tools for better viewing and working with 3D objects. ©Copyright 2005-2019 ideaMK. All Rights Reserved.